Municipal elections matter. But not in the way we think. Cape Town – With eight days to go before the local government elections, South African citizens are all but satisfied with service delivery at municipal level, a survey by the South African Customer Satisfaction Index (SAcsi) shows. Sacsi, an independent national benchmark of customer satisfaction, surveyed close to 2 700 residents in a randomly selected sample of residents in Cape Town, eThekwini, Tshwane, Johannesburg, Ekurhuleni, Nelson Mandela Bay, Mangaung and Buffalo City. None of the country’s eight municipalities are meeting the expectations of their residents with an overall score of 59.5 out of 100. “Citizens are voicing their frustrations in increasingly violent ways,” says Adrè Schreuder, founder of SAcsi. He suggests that municipalities should consider including citizen satisfaction as a formal scorecard for measuring the effectiveness in each municipality. “Low (satisfaction) scores are a three-year trend for municipalities, so this is not a case of one bad year,” he adds. Of the eight municipalities, Cape Town residents rate services as closest to their expectations with a satisfaction score of 70.3 out of 100. 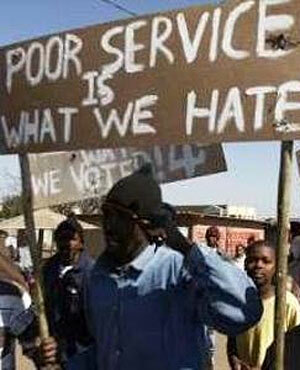 Cape Town has also recorded the lowest complaint levels of all the municipalities that were part of the survey. - Ekurhuleni: 58.1 out of 100. Trust in Ekurhuleni has declined back to levels first reported in 2014, which goes hand-in-hand with an increase in complaints reporting this year. Ekurhuleni has very high complaints incidence of 47% and this figure has been rising each year for the past three years. Most complaints centre on water problems, followed by street and road quality and electricity problems, says Schreuder. - eThekwini: 61.4 out of 100. Citizen satisfaction score dropped from 65.4 in 2015 and it’s the only municipality where residents expect less of the municipality this year, likely as a result of political in-fighting. Complaints are 5% lower than 2015, but Schreuder cautions that complaints could decline as a result of complaint channels that are not operating properly. - Tswhane: 61.4 out of 100. Citizen satisfaction dropped by a notable two index points since last year, retaining Tshwane’s performance as on par with the average. There were fewer complaints recorded in 2016 than 2015, though it should be noted that the survey was done before the recent June 2016 unrest, which would likely have had an impact on the results. - Johannesburg: 54.7 out of 100. Citizen satisfaction here is at its lowest level in three years down by almost six index points from 60.2 in 2015. Residents indicate a significant gap between expectations and delivery. The protracted rubbish collection strikes possibly weighed heavily on the minds of Johannesburgers, as the data was collected during this period of 2016, says Schreuder. - Nelson Mandela Bay: 55 out of 100. The score is an improvement on last year’s one. Expectations rose significantly in 2016, probably as a result of the high profile change in the city’s management. - Mangaung: 52.9 out of 100. Perceived quality improved significantly by six index points, which is still below the average score. Mangaung has made some improvements and there are fewer complaints each year and complaints are better handled each year, says Schreuder. - Buffalo City: 47.6 out of 100. This is the lowest score of all eight municipalities. In addition, residents here reported the highest level of complaints at 54% ­­– one out of every two residents. Verbatim comments SAcsi received from respondents included issues with rodent problems and the most basic municipal services, says Schreuder.